Grax masks the energy signature of the bot he�s bonded to, making Skullsmasher invisible to the Autobots. So� Skullcruncher. Never owned him as a kid. Never even heard of him. Didn�t know what a Headmaster was until a few years ago. Yet, I bought him. After getting back into collecting in recent times, I was looking for figures that were purely fun. The Combiner Wars and Titans Return lines seem to be aimed in that direction. 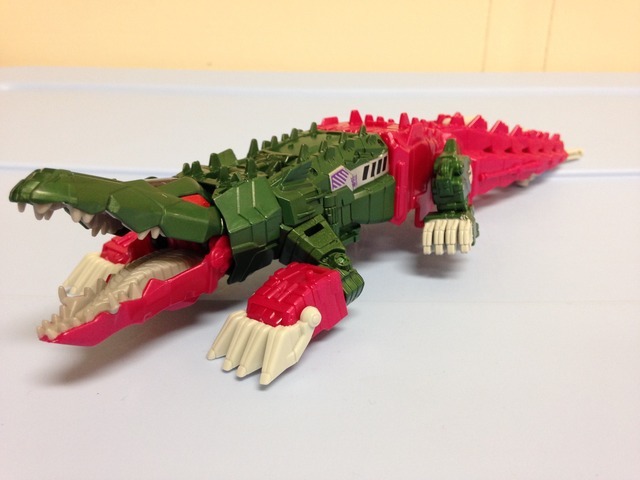 Skullcruncher�s alternate mode is a pink and green crocodile. I know this because: A) TF Wiki tells me so, and B) my kid�s Wild Kratt�s books have described to me the difference between alligators and crocodiles. The croc mode looks nice and robotic, but is fairly well proportioned. There�s a bunch of molded detail everywhere with panel lines, ridges, and semi-scaly looking parts all over. There really isn�t much of his body that isn�t covered in detail, giving Skullcruncher a nice look. The coloration is pretty evenly green and pink, with a touch of light grey parts here and there. On his sides and head, you will find some other greys and black, with small Decepticon symbols. The eyes are done in a red color, in contrast to the pink everywhere else. The mix of molded detail and evenly mixed colors results in a good looking alternate mode. And hey, how many crocodile Transformers do you know of? As for features, Skullcruncher doesn�t do a whole lot. You can sway his tail back and forth, and his legs move around a bit. More interestingly, his back opens up to reveal a cockpit for Grax to reside. It�s a shame you can�t see him in there, though. The door is a bit on the rubbery side � it�s OK to open and shut, but if you push that sucker past the closed position, it�s a chore to get it back open. 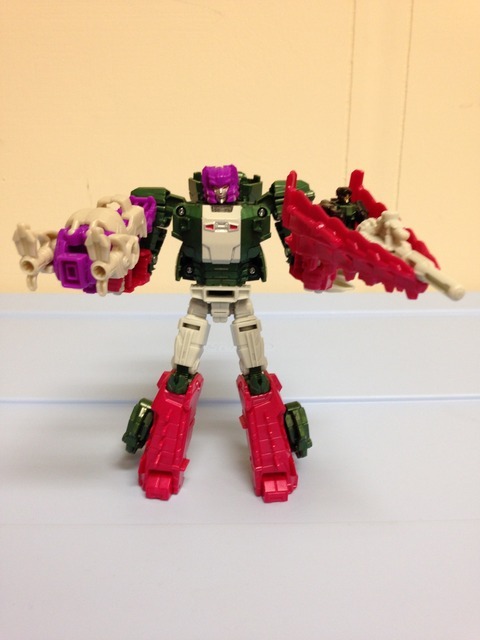 Finally, Skullcruncher�s head moves around with some decent range, and his mouth opens wide. Inside you�ll find some well detailed teeth and a tongue. It comes together nicely, and for a Transformer that turns into a crocodile, I don�t think you could ask for much more. Since the dawn of the Combiner Wars lines, Transformers seem to have taken the simpler route with their transformations. The Titans Return line appears to be no different. With Skullcruncher, things simply move where they need to with no tricks or sticky parts. Getting him into robot mode is pretty fast and easy. Getting Skullcruncher to stand easily is significantly more difficult. It�s not that the robot isn�t balanced � it seems to be balanced quite well. The problem is the aforementioned QC issues. As I understand it, Skullcruncher figures universally have really loose hips. 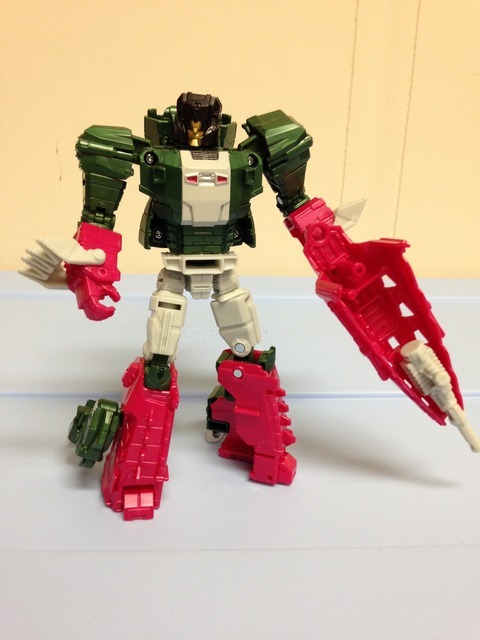 The one I have is no different � and I find it hard to have Skullcruncher do much besides stand straight. Movement in mostly any direction requires careful hands, or his legs will scoot wherever they please. This can be fixed with a little clear coat nail polish, but let�s face it � this is a mass retail release, and this should have been fixed before proceeding into production. This is a sad problem, because otherwise Skullcruncher would be a fantastic figure. Aesthetically there�s the same detail here as in croc mode, but with a bit more grey to be found, and the chest has some decent paint apps. I�ve heard some quibbles here and there about Skullcruncher�s head mold (at least in the US release), but I have no problems with it. Overall, Skullcruncher is overall a nicely detailed and proportioned figure. 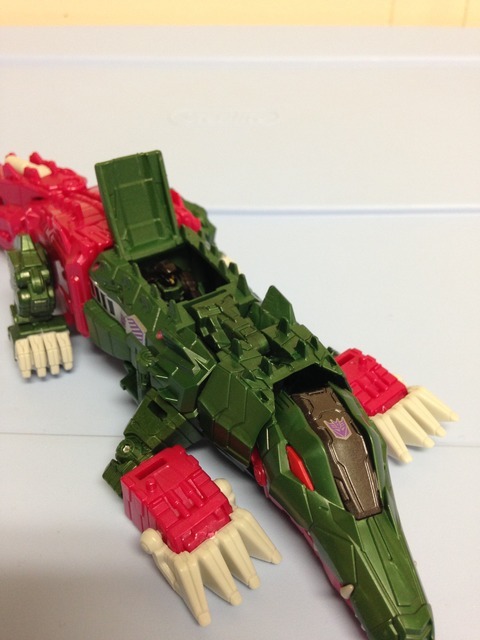 There is one issue with Skullcruncher�s head - if Grax�s head is pointed backwards, the neck is ridiculously loose. This is easily solved by switching Grax�s head to face forward for a tighter fit. Once that�s in place, the only remaining problem is the hips that I previously mentioned. As for other articulation, Skullcruncher can be positioned rather well. Knee swivels and ball/swivel hips, shoulders, upper arms, and elbow joints all give Skullcruncher a great range of motion. He�s no contortionist, but nothing seems to be hindered beyond belief. If you can get him to stand up, he can be put into a variety of positions without issue. Skullcruncher has a couple different weapons - one that I like and one that I don't care for at all. The good one is his small grey blaster that he can wield, or peg into his tail for an extra large gun - or to be used as a Headmaster operated cannon. It's a fun and neat little contraption that really adds some extra play value. The weapon I don't really care for is the aforementioned tail. It's large and unwieldy, and if you're not using it in conjunction with the small blaster, it's kind of an eyesore. On the plus side, you can flip Skullcruncher's croc head around and peg it to his back, but it makes him back heavy and hard to pose. It's an unfortunate result of the design, and in the end, you can just set it aside in robot mode. The Headmaster functionality works well, but it works best when paired with more Titan Masters, or crossed between other Headmasters. Personally, I have used him only with Crashbash. It�s a fun feature, but you have to realize that the Titan Masters can range wildly in color. The bright purple of Crashbash seems out of place on Skullcruncher � but there isn�t a great alternative. It�s quite enjoyable to have another Titan Master reside as Skullcruncher�s head while using Grax to power his tail cannon � or vice versa. These features are where the Titans Return line really shines. The downside is the collective cost of such fun � the base price for a deluxe runs $15-20 USD, and the Titan Masters are ~$5 USD each. Just to build up a few, you�re looking at $20-30 USD to have some fun. It gets costly in a hurry if you want to take full advantage of what the line has to offer. 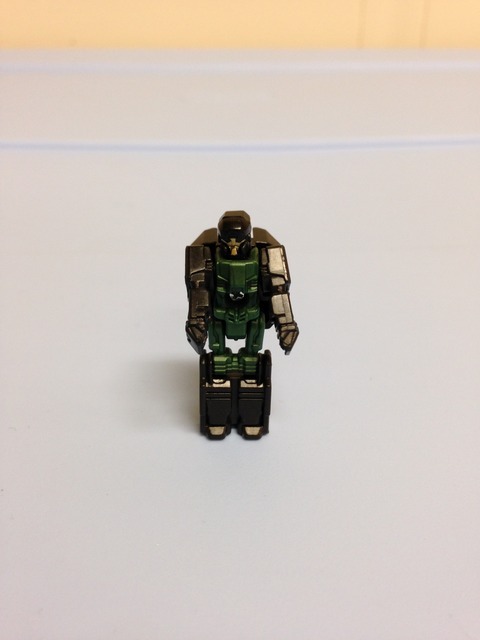 A figure as relatively obscure as Skullcruncher doesn�t come along often. He�s an overall fun figure, and if you�re looking to jump into the Titans Return line for the functionality, Skullcruncher is a good place to start. Transformation Design: 7. No frills, but fun. Everything easily goes back and forth. This is not an engineering marvel. Durability: 6. The quality is OK, but the loose hips sink this ship. Fun: 8. It�s hard to rate this one too high, since the real fun comes when making more purchases for cross-functionality. Aesthetics: 8. Good detail all around, and true to the original. And he�s a crocodile � that�s just unique. Articulation: 5. Just average. Nothing fantastic to be found. Value/Price: 6. Just a bit above average � Skullcruncher is fun, but you have to buy a few more Titan Masters to make the value really worth it. Overall: 6. Skullcruncher is fun, but you don�t need to hunt him down. 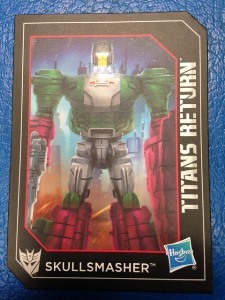 The additive cost of the Titans Return line (for fun purposes) makes this a hard sell, as do the loose hips. He�s a good way to get into TR, but you�ll be fine if you can wait for a price drop.